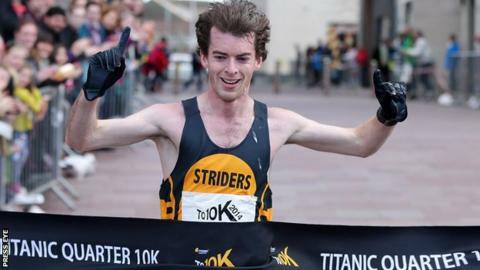 Paul Pollock showed his class by securing a comfortable victory in Sunday's Titanic 10K race in Belfast. The Holywood athlete clocked a time of 30:37 minutes to take the men's title, with St Malachy's runner Joe McAlister well back in second in 31:57. Foyle Valley's Scott Rankin came in third in a time of 32:27. Offaly woman Ann Marie McGlynn won the women's title in 35:16, over a minute clear of Natasha Adams with Gerrie Short back in third. Lifford Athletics Club runner Adams finished in 36:22 while Short, of Beechmount Harriers, had a time of 39:49.